Wow, the formatting in this forum lets you do some really cool stuff with the layout! Thank you for your effort on this Muspila. These will be very useful, Worsas. Thank you for the work. Yeah, really good work on this! I have say, this looks extremely impressive. I've always loved maps. Someone at Tamriel Rebuilt created a high-res overhead picture of the entire province up to that point (even though the Deshaan and Shipal-Shin regions were nothing but brown heightmap) and I was wondering if us public forum viewers would be able to get a full map like that of all of Skyrim that has been worked on up to now? Even the parts outside the Reach that have been touched? I'd be really interested to see that. I don't know if something like that is out on the old forums already and I missed it. Add a few cliffs and rocks in that leftover grassland area and that direct road to the city, and we're almost good to go, methinks. Edit: I see roerich already indicated the move I suggested. My change proposals. 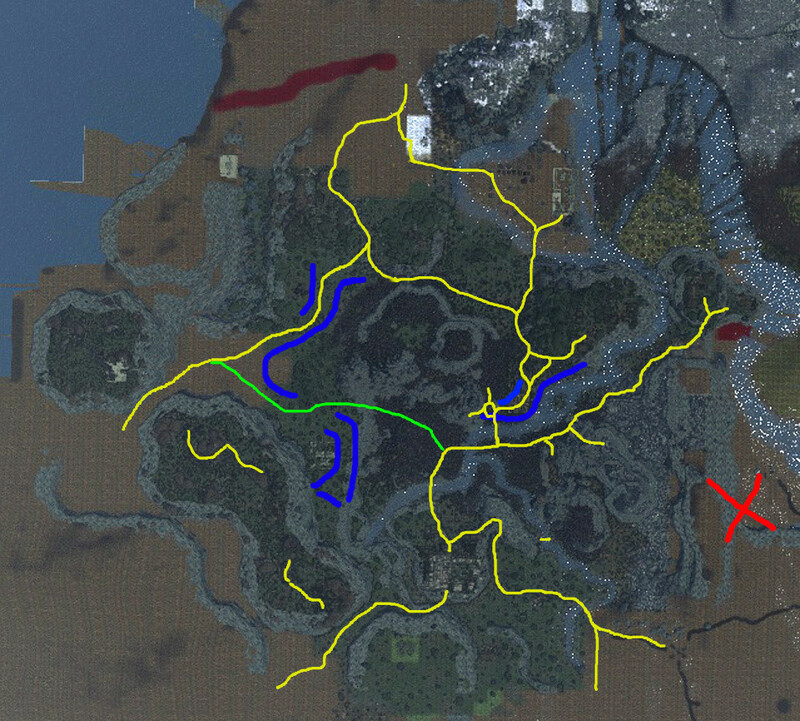 Many of the yellow lines added here are just roads that already exist. I propose doing without that additional road between Markarth and the forest you added on your draft. To me it seems like there was too little hill material between the two horizontal roads to warrant them both. It could work though, if you ever change the area south of markarth to feature more subdivision. The blue lines are cliffs that have been added in aswell as further cliff suggestions. The green line is the direct road between karthwasten and Dragonstar discussed with Yeti. Without that additional green road or something comparable I fear we'll not have gained much in comparison to the previous road layout. Scamp's Dragonstar suggestion sounds good to me. Edit: As does Worsas's road suggestions. To this day I still don't know what that big red smudge on the terrain is. Vertex colour marking something to be done later, maybe the edge of the Solitude forest. I believe it marks the border between The Reach and Haafintheim Holds.